Well, it’s finally over. Thank goodness! 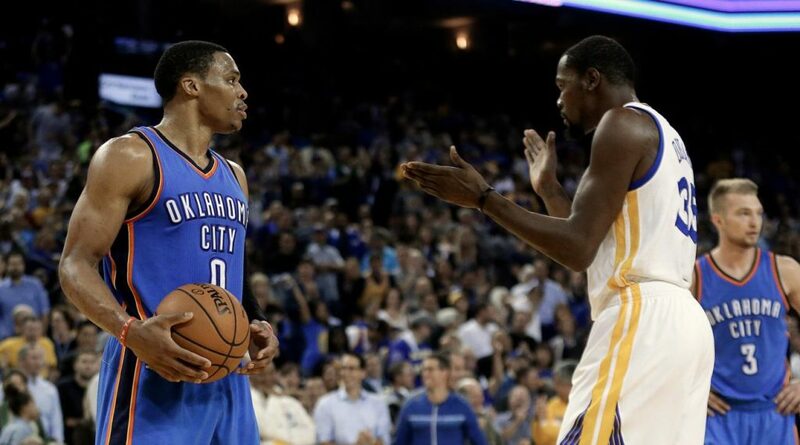 This season, all any basketball fan could talk about was the bad blood between Kevin Durant and Russell Westbrook. It was the most bitter breakup professional sports had seen in years. It wasn’t long ago that these two appeared destined for greatness. They both still are, just not as teammates. That was until Sunday night at the 66th Annual NBA All-Star Game. Back in 2012, Westbrook and Durant, alongside James Harden, took the Oklahoma City Thunder to the NBA Finals. They ultimately lost to LeBron James and the Miami Heat but it looked like the team from the dusty Midwest was on to great things. Then Harden left. Last year, Durant followed him out the door, leaving Westbrook all by himself in a cupboard-bare Oklahoma City. In a fairy tale of another sort, Durant was supposed to be OKC’s savior. Originally drafted by the Seattle Supersonics, who eventually became the Oklahoma City Thunder, Durant was going to be the one to take the team and the town to the proverbial promised land. He would be their best, and certainly most beloved, player ever. A point guard of reckless abandon, Russell Westbrook would be the driving force behind it all. Destiny would have them as one of the sport’s greatest duos of all-time. Sometimes destiny changes her mind. 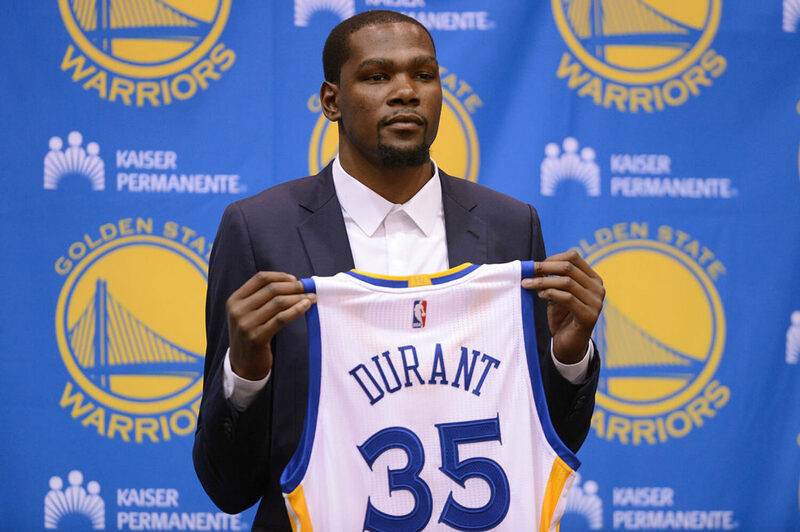 Last off-season Durant decided to take his talents to Golden State. Harden leaving Oklahoma City made headlines but not quite like the rift that Durant leaving created. Old school ballers criticized Durant for taking the easy way out and joining a ready-made championship team in Golden State. The Warriors had already won a title. Even though they lost last year’s Finals to Cleveland, Golden State still had the capabilities to win another even without Durant. Going to Oakland was Durant’s soft option. Worse than that was the gap it created between him and Westbrook, two players we once believed to be the best of friends and who now no longer spoke. All the media could talk about from the season’s start was the feud between the two, how Durant crushed the hopes and dreams of a city and how, by leaving, he took away Westbrook’s only shot at a title. It matters not that this team might not have won had he stayed. We only deal in hypotheticals and betrayal. When Durant returned to Oklahoma City for the first time since joining Golden State, the boo birds rained down from the rafters. He and Westbrook barely spoke. That was until the end of the game when we saw some healthy jawing between the two. 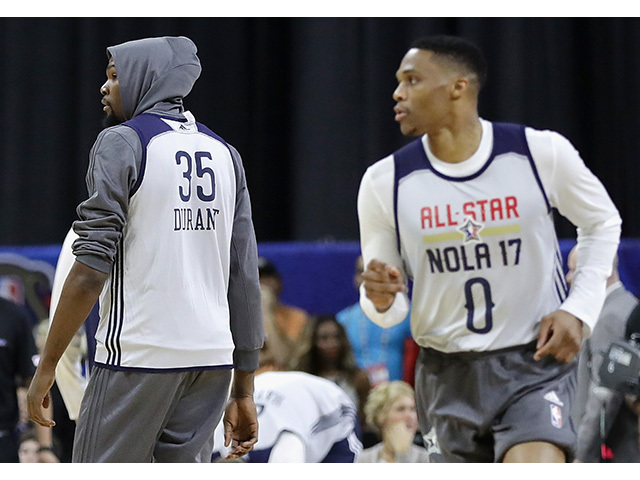 This All-Star weekend, the two would be reunited on the same team for the first time since the split. How many minutes would they play together was all anyone could ask. Would they pass to one another? Would they speak, argue, embrace, high-five? The complicated dynamic between the soft-spoken Durant and the explosive Westbrook made for great gossip, the equivalent of the Academy Awards asking Brad Pitt and Angelina Jolie to present an Oscar together. Fireworks were inevitable. Personally I thought the media made far too much of the whole ordeal. I haven’t written about it before because a) everyone else already has, leaving nothing more to be said and b) relationships come and go. People break up and move on. Some decisions are neither right nor wrong; they are just made and that’s that. Nobody plays together forever, so what was the big deal and why did every question have to do with their falling out? I even felt sorry for the two former teammates. If I got asked the same question about an ex a thousand times over, I’d grow tired of it too. They’re no longer teammates, they’re no longer friends. It happens. Kevin Garnett still hasn’t forgiven Ray Allen for joining Miami to win a title and that was five years ago. And then it happened, the moment we’d all been waiting for, the exact opposite of how we expected. Minutes into the All-Star Game, we were witness to a dazzling, alley-oop pass from Durant to a driving Russell Westbrook. In a game that featured 103 assists and 75 dunks, the Durant to Westbrook slam was the highlight of the night. Minutes later, TNT sideline reporter David Aldridge grilled both all-stars, trying to get one of them to say something about the dunk and the bitter break-up that preceded it. Was there resolution or still resentment as if a single pass could change anything. They both took the high road, not feeding into the hype. They wanted the talk to be over just as much as we did. There was not much else to the story, just two former teammates going their separate ways. They weren’t the first to do so; they won’t be the last. Players have left the teams that drafted them before. Dynamic duos have failed to live up to expectations. I’ve heard not a single pundit propose that maybe Durant and Westbrook actually didn’t. Maybe for them, that was as good as it got. For those of us begging for an end to this story, closure has finally arrived. During the time out right after the alley-oop, Westbrook and Durant’s Western Conference All-Star teammates showered them with praise, jumping up and down on the sidelines like the young men they are, apparently as happy as the rest of us that we could finally put this story to bed. Rest assured that the bad blood still exists. Fortunately, the conversation about it no longer has to. This entry was posted in Featured, Hardwood and tagged James Harden, Kevin Durant, Kevin Garnett, NBA, NBA All-Star Game, Oklahoma City Thunder, Ray Allen, Russell Westbrook, Seattle Supersonics by Chris Humpherys. Bookmark the permalink. Clay Bennett and the Thunder ownership group are among the dumbest executives in all of basketball. GM Sam Presti has now presided over the departure of two great players while the Oklahoma City Thunder are no better than an average team as their record reflects. Given their idiocy over the last two years and lack of action their fate is deserved. Meanwhile , Phil Jackson and Steve Mills are trying put on happy faces while the Knicks continue to pi$s away another season. On his best Jackson couldn’t spot talent if he were given written instructions as an assist. Your thoughts on the impending departure of DeMarcus Cousins as he leaves the Sacramento Kings to join the New Orleans Pelicans ? Amen – preach on brother. I tried to listen to ESPN radio today and had to put on a CD because they were trying to milk one more day out of the Durant / Westbrook saga. BTW, your comment about listening to Russilo and Kanell was spot on – they are about the only ones worth listening to – I like Russilo (although Kanell is getting into the “say it just to see if I can get somebody to freak out on me so I get attention” mode). Another BTW – wearing my brand new SC tee today at work!!! Thanks again. Baseball talk, anyone…anyone…anyone…naw, I didn’t think so. New Orleans has less than a half a season to put things together. That being said, we haven’t seen a twin towers this entertaining since Robinson-Duncan. I imagine they’ll switch 4-5 depending on the match-ups their opponents present. Either way, if coached properly, they’ll be tough to defend. I’m not calling any upsets but we’ve seen the best way to beat Golden State is with size and post-play. Despite their size down low, their guard play will be equally important to set the tempo they desire. Sure there was some bad blood, hurt feelings and even a little on court drama recently with Russ telling KD, “I’m coming”, but I think it’s much ado about nothing so far. If they ever get a playoff matchup, then maybe we can call it a full blown rivalry. Unfortunately for KD, Bleed, I’m not convinced OKC has much of a shot against GSW. How about the pleasant drama we got tonight from Vlade after the Kings trade? I know you were paying attention to that nonsense. And doesn’t Shaq own part of the “Queens?” If so, why isn’t he playing more of a part in the decision-making? I know the Lakers were involved in talks with Sactown, but the Queens were insistent that Brandon Ingram be included in any deal. The Lakers told them to pound salt. I’m not sure that’s what Vlade is referring to but it was all over the radio and Lakers websites the last couple days. As far as Shaq, I know about as much as you. Even without Ingram, I would think the Lakers could have offered a better deal than what Sac settled on. But truth be told, I’m anything but broken up about it. Cousins is a remarkable talent, but a problem child with an attitude problem. Not the kind of influence we need with the young, developing roster we have, nor condusive to the type of winning, professional culture Luke Walton is trying to build here. My hope is that the twin tower experiment blows up in New Orleans and we somehow end up with Davis… Pipe dream I know, but you know the color of my glasses. Were now talking trade with Chicago for Jimmy Butler. We’ll see where that goes. I’m with you on all counts there, Bleed. As a GM, I’d probably steer clear of Cousins. A leopard doesn’t change his spots. And while I think landing Butler would be a coup, is he a top ten talent in the league? Will he ever be? Someone’s gonna give him top dollar but he’s just one piece to a puzzle the Lakers, or whoever lands him, will have to build to create a championship team the likes can topple Golden State, Cleveland or San Antonio.